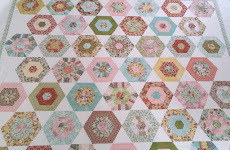 I've had a few enquiries about my Curio Jelly Roll Hexagon quilt, so I've decided to post a tutorial on how I made the quilt. It took quite a lot of fiddling and calculations to work out the pattern pieces using jelly roll strips, so to save others time, here are the basic instructions and ingredients. 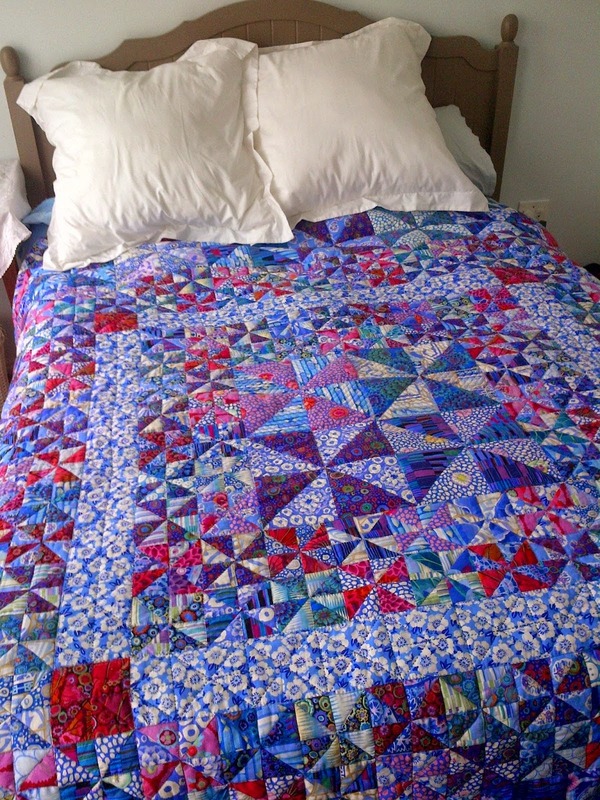 The finished quilt is approximately 65" x 77". 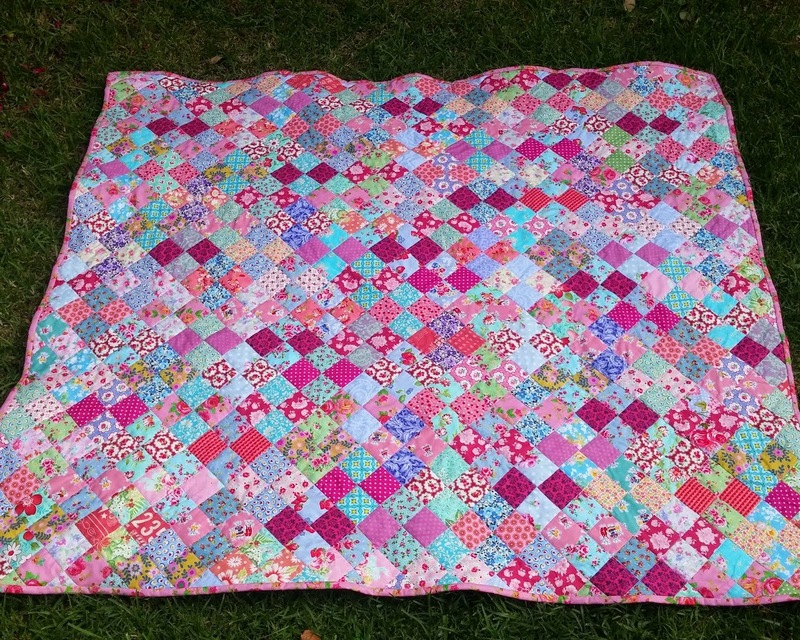 The quilt is inspired by the My Fair Lady quilt by Brandon Mably from Kaffe Fassett's book, "Quilt Road". 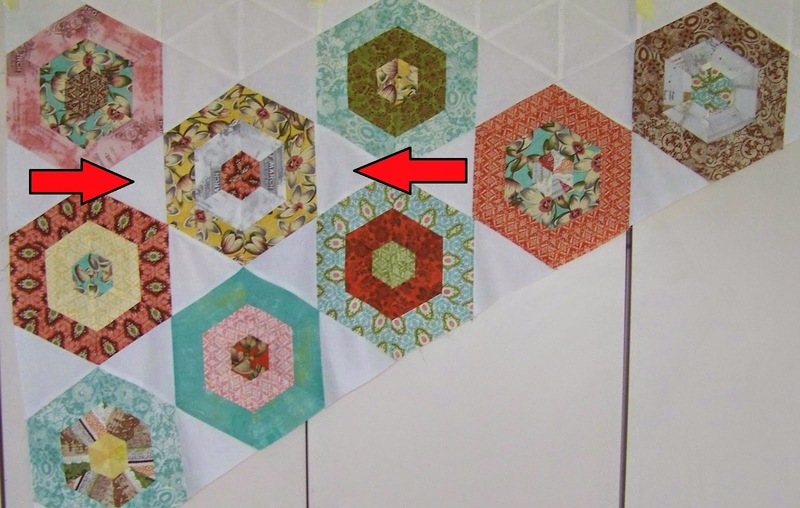 One needs to make 46 banded hexagons in total, so one has to cut extra jelly roll size strips from additional printed fabric yardage. If a typical jelly roll contains 40 strips, and one needs 3 strips to make 2 full hexagons, thus one can only make 26 hexagons from the strips supplied in one large jelly roll (40 divided by 3 = approx. 13 sets of 3). Thus, I had to cut another 30 jelly roll size strips (2.5" x 42") from extra fabric yardage, which means that I needed at least another 1.75 yards (60") of printed fabric in total (in different prints) to cut the extra strips. I also did not use some of the Moda Curio jelly roll strips because they were too dark (black, brown, dark orange) for my liking, so I replaced it with my own cut strips. Thus in total one needs 69 (2.5" x 42") jelly roll size strips. 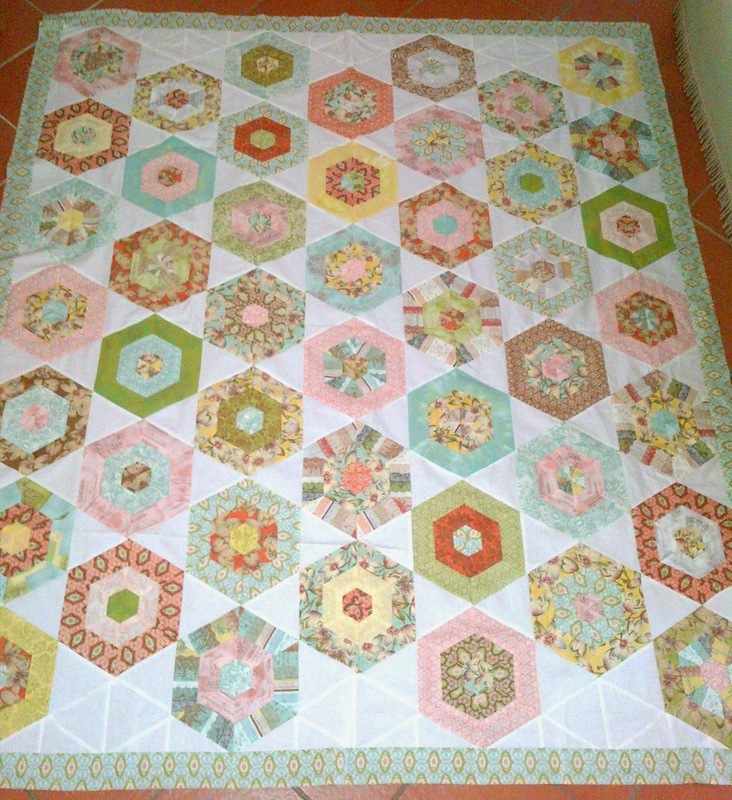 So you could buy 2 jelly rolls to make the quilt top, and throw out the strips that are too light or dark (or ugly). Once you have enough jelly roll strips (69 strips), make bundles of 3 strips (as shown in Figure 2). Make sure that there is enough contrast between the strips in each bundle. Because I wanted the striped bands in each hexagon to be the same width, I had to shorten the width of the Jelly Roll Strips. I did this by using a larger seam allowance of 0.5" (instead of the usual 0.25") rather than cutting the strips. Thus, I ended up with 23 sewn sets of 3 strips (Figure 3). The outer bands of each sewn set ended up being 2" wide and the middle band was 1.5" due to the 0.5" seam allowance used (See Figure 5 later). Each hexagon is made up of 6 identical 60° triangles. As shown in Figure 4 below, one gets two different hexagons from each 3 strip set; the middle band will be the same print, while the inner and outer bands will be opposite. I bought a Perspex 60 ° quilting triangle ruler template, which helped me to cut the triangle pieces accurately (see Figure 4). I made the 60° triangles to have a base of 6", which meant that that the height of the triangles was 5.25". This ensured that I could cut 12 triangles (6 up and 6 down) from each sewn strip set (See Figure 5). I made sure that the top point (apex) of each of the 60° triangles was placed on the top of each of the strip sets (Figure 5). Thus when one cuts a triangle, the top band is 2” wide, the middle band is 1.5” wide and the widest bottom band is 1.75”. Thus the height of each 60° triangle = 2” + 1.5” +1.75” = 5.25” and the base width = 6”. One must cut 6 triangles up and 6 triangles down from each strip set, using the up and down placement shown in Figure 5. Thus the 23 sewn strip sets must be each cut into 12 triangles (6 up and 6 down) to produce 46 hexagons. In total one must cut 130 solid background 60° triangles, with a base of 6” and a height of 5.25”. 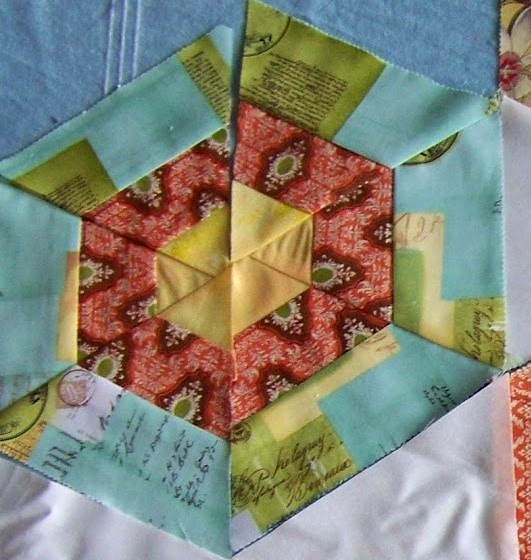 The easiest way to do this is to cut 5.25” strips of the solid background fabric (from the fabric width 42-44”), and then cut 6 triangles up and 6 triangles down using the triangle ruler template. 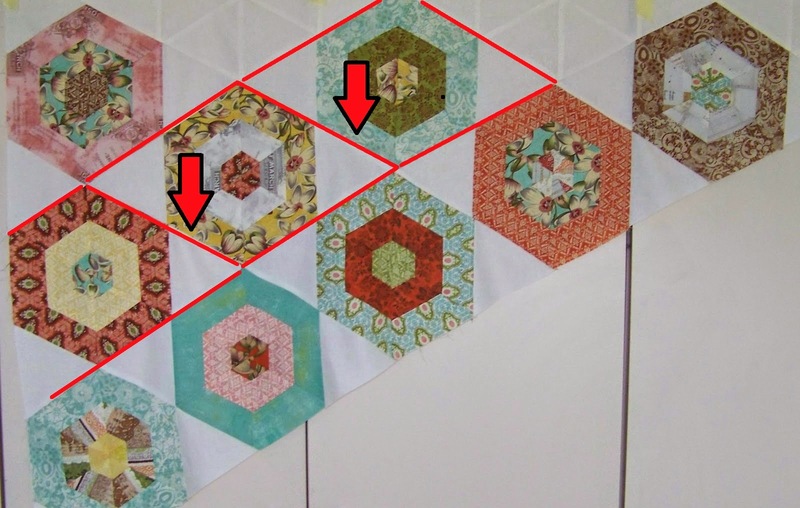 From each set of 6 banded triangles, stitch 3 together along diagonal seams using usual 0.25” seam allowance and press seams to one side (Figure 6). Repeat for the remaining 3 triangles (Figure 6). Now stitch two halves of each hexagon (consisting of 3 joined triangles) together using usual 0.25” seam and press seam to one side. Do this for all 46 hexagons and then arrange the hexagon blocks layout as desired (Figure 7). Make sure that there are alternating coloumns concisting of of 6 or 7 stacked hexagons (See Figure 1). Attach 2 solid background triangles to the opposite vertical edges of each hexagon to form a diamond shape block (Figure 8). The border rows of hexagons will only require the attachment of one solid background triangle (Figure 8). Join the diamond blocks diagonally to form long diagonal strips (Figure 9). 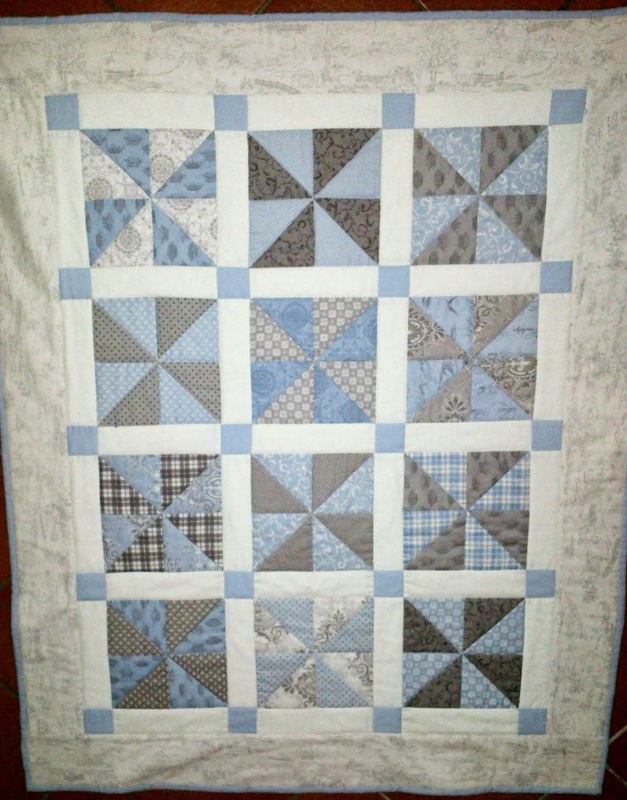 The join the diagonal strips to one another to build the quilt (Figure 9). In some cases you will need to assemble partial hexagons from the solid background triangles in order to fill gaps (See Figure 1). 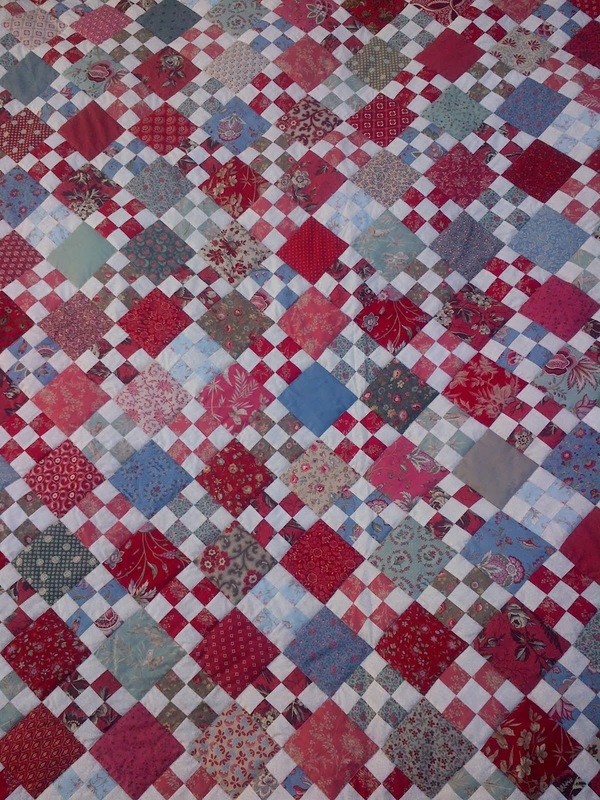 You will have to trim the upper and lower edges of the quilt using a rotary cutter to make it square. Add a printed border using strips of any desired width, I used 2.5” strips to make the border (See Figure 1). Finished quilt size is approximately 65” x 77”. This is such a great tutorial, thank you for taking the time to put it together. 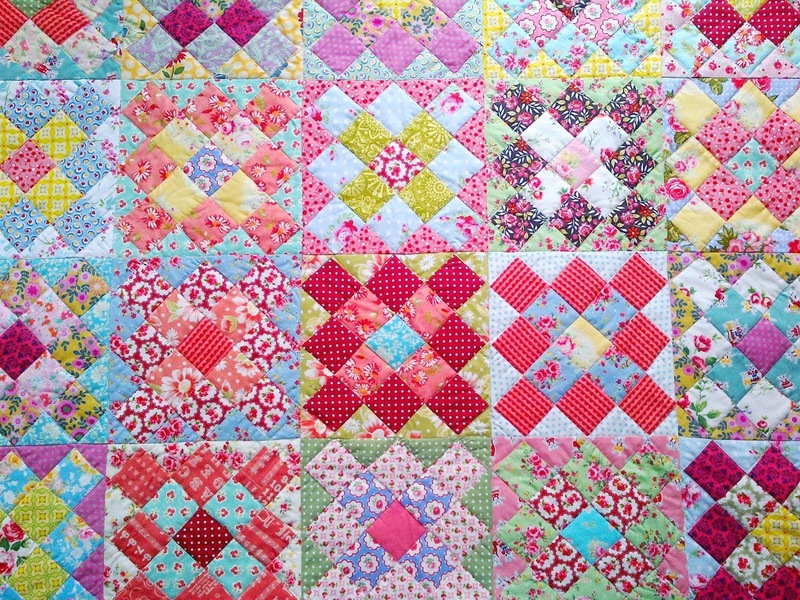 Your quilt looks wonderful in the Curio fabrics.